For most university students across Canada, this week marks the end of summer and the first full week of fall classes. As CCPA noted on Wednesday, most students celebrated ‘back-to-school’ with tuition increases and higher student debt. However, new data from Statistics Canada suggests that students are not only struggling with tuition costs, but they are also struggling to find summer employment – traditionally, a way for students to help pay for University. The result is that students are being squeezed on both sides, trying to cope with higher tuition fees and growing debt on one side while having a harder time finding jobs to pay for it. On Friday Statistics Canada released the latest Labour Force Survey including statistics on summer employment by students who were planning to return to school in the fall. Student employment was hit hard by the recession in 2008-9 and still hasn’t recovered. The summer employment rate of university age full-time students is still 4.1 percentage points below pre-recession level of 71% and hasn’t recovered as fast as the (also dismal) youth employment rate, which presently sits at 79.2%. The employment rate is the employment-to-population ratio and is useful in this case because it doesn’t exclude people who aren’t actively looking for work. The employment-to-population ratio below chart, indexed at pre-recession levels, shows the extent of student job losses. And the low student employment rather is not for lack of trying. The labour force participation rate of full-time students has declined slightly from 78.4% in 2007 to 76.4% in 2013 (perhaps as more students decided summer classes are a better bet than the job market) but the unemployment rates among full-time students have jumped over that period. The unemployment rate of full-time students is 12.5%, which is down from 2009 when it hit 14.7% but still 3% above the pre-recession level. 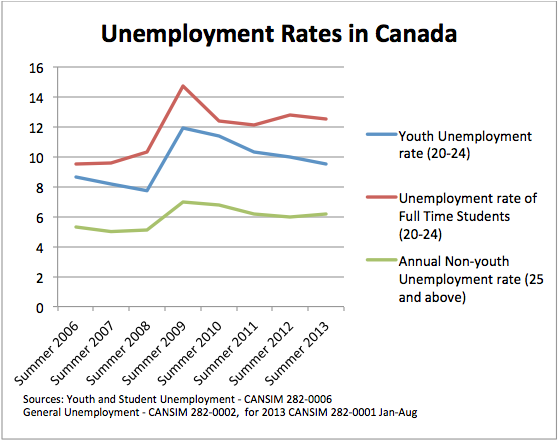 While the youth unemployment rate for non-students and the general unemployment rates are making a slow recovery, the summer unemployment rate for students was higher in 2012 and 2013 than it was in 2010 and 2011. In real human terms, that means there were about 96,050 students who wanted to work this summer but couldn’t find a job. Remember that figure the next time a pundit says that students should just “work harder” to cover rising tuition costs. • Dude, where’s my job? 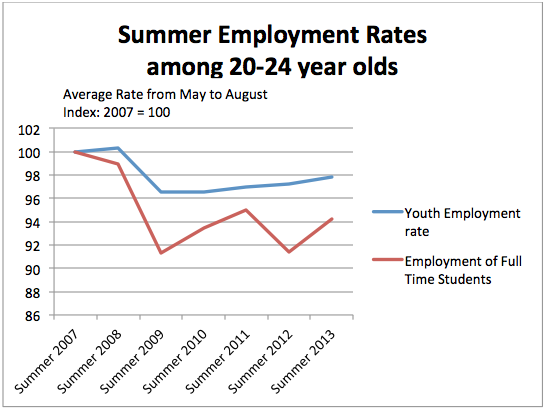 Hello Kayle Hatt, I just wanted to note that when you compare the students unemployment rates between this summer (12.5%) and that of summer-2006 (9.5%), the increase is not 12.5-9.5=3.0%, but is 12.5/9.5 -1=31.6%! In other words, if in 2006 we had 10^5 students, 0.095*10^5=9500 were unemployed. Now there are 0.125*10^5=12500 of them who are unemployed. So the relative increase in the unemployment is 12500/9500 – 1 = 0.316.